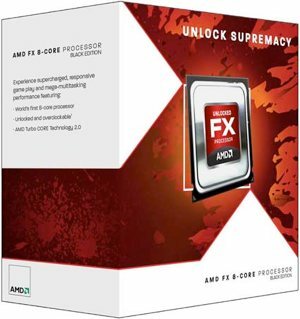 Last month at the E3 conference in Los Angeles AMD officially reintroduced the FX brand for their top performing processors aimed at PC enthusiasts and gaming aficionados. Although no actual products were launched, we already have a pretty good idea of the initial lineup, and now Turkish website DonanimHaber is offering a glimpse at the performance we can look forward to. The site managed to get their hands on an engineering sample of AMD's forthcoming FX-8130P and ran it through a range of tests. The 8-core chip features 3.2GHz clock speeds, 2MB of L2 cache per each pair of cores (8MB in total), and 8MB L3 cache shared between all modules. The motherboard used was a Gigabyte 990FXA-UD5, which was paired with a GeForce GTX 580. Bulldozer scores P6265 in the 3D Mark 11 benchmark, 3045 in PCMark 7, 24434 in Cinebench R10 and manages 136 and 45 frames per second in x264 encoding tests for Pass 1 and Pass 2, respectively. In addition, it took 19.5 seconds to complete SuperPi 1M. Unfortunately there are no Core i7 2600K scores to compare with -- and the benchmark programs used differ from our usual range of tests -- but VR-Zone claims typical scores for Intel's top Sandy Bridge part are lower in all tests except SuperPi 1M, where it is significantly faster. Compared to the Thuban-based Phenom II X6 1100T, Bulldozer should end up about 50% faster, while overall it slots right in between the Sandy Bridge Core i7 2600K and Gulftown-based Core i7 990X in terms of performance. Of course scores will vary from platform to platform so we'll reserve judgment until we can put Bulldozer to the test ourselves. If these early comparisons hold up, though, AMD could finally have an answer to Intel on the high-end. The rumored $320 price tag suggests that will be the case considering Intel's Core i7 2600K costs roughly the same.